What else do science and technology PhD students do when they graduate besides work in the academy? According to the Distinguished Awards office of Arizona State University's Graduate College, some join the legislative and executive branches of government, and others should be interested in following suit. For example, ASU alum Mary Hannah Schultz helped a U.S. senator make sound policy decisions. Current ASU faculty member Darshan Karwat assisted executive branch federal agencies to solve complex problems. Both Schultz and Karwat are alums of the Science & Technology Policy Fellowships program administered by the American Association for the Advancement of Science (AAAS). Fellows serve yearlong policy advising assignments in the federal government. According to the Distinguished Awards office, the merging of science, technology and policy makes the fellowship a natural complement to graduates of ASU, which has a strong reputation for interdisciplinarity, STEM and policy. The Science & Technology Policy Fellowship is a tempting option outside of the academy for newly minted PhDs. It’s well paid ($80,000–$105,000 yearly), provides excellent benefits and is a high-impact position. About half of fellows return to the academy at the close of their tenure, with the majority of the remaining transitioning to permanent positions within the federal government and other policy-oriented institutions. Both Karwat and Schultz returned to the academy after their stints in the federal government. Karwat is now ASU faculty in the School for the Future of Innovation in Society, and Schultz is now a visiting professor at James Madison University. The Distinguished Awards office in the Graduate College has begun to actively recruit for Science & Technology Policy Fellowships from ASU’s talent pool with the assistance of AAAS program officers, ASU’s Office of National Policy Affairs, the Lorraine W. Frank Office of National Scholarship Advisement at Barrett, The Honors College and ASU-affiliated Science & Technology Policy Fellowship alums. On Oct. 10, 2018, the Distinguished Awards office hosted an information session for Science & Technology Policy Fellowships with the help of Karwat, Schultz and personnel at AAAS. ASU’s event had one of the largest turnouts for an fellowship recruiting event. Typical fellowship recruiting events at other large research universities measure about 20 attendees. ASU’s event had 62 attendees. Karwat provided the executive branch perspective and Schultz provided the legislative branch perspective for attendees. ASU Now asked Schultz if she would further help us to understand why newly minted STEM PhDs might want to pursue a Washington, D.C., fellowship appointment instead of the more traditional positions in the academy. 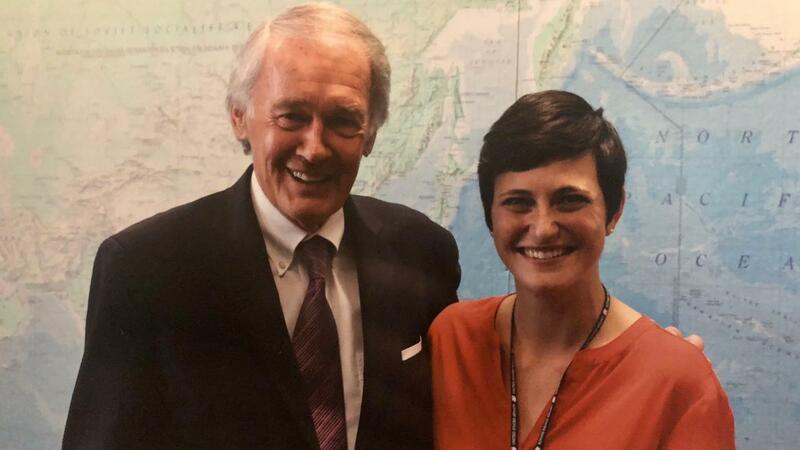 Schultz served as a fellow in Sen. Edward Markey’s office immediately following her graduation from ASU’s Geological and Earth Sciences program in the School of Earth and Space Exploration. Question: Can you tell us a little about Science and Technology Policy Fellowships, how you became familiar with the program, and how you decided to apply for it? Answer: The Science and Technology Policy Fellowship is an opportunity offered by the American Association for the Advancement of Science and partnering scientific societies for PhD scientists to experience and contribute to the world of policymaking for one year in one of the branches of government. I learned about the program through one of my PhD adviser’s former students, who was a congressional (program fellow) sponsored by the American Geophysical Union and is now the associate director of natural hazards at the United States Geological Survey. He told me he had a wonderful and fulfilling experience working in Congress and encouraged me to apply after hearing that I had an avid interest in politics and government affairs. I learned much more about the program at the American Geophysical Union’s Fall Meeting before I submitted my application. Q: Can you share any particular strategies that you employed in the application process? A: The most important piece of advice is to research the AAAS Science and Technology Policy Fellowship website and take a look at the partnering societies that sponsor fellows. You may submit applications to all of the societies that are pertinent to your area of research, which may increase your chances of advancing to the interview round and getting chosen. One of the most frequent questions applicants pose is whether or not they need experience in policy before applying. I had zero policy experience before submitting my application! I did make it very clear in my statement of purpose that I thrived on outreach activities and teaching during my doctoral work. Q: You served in the office of Sen. Edward Markey. What was that like? A: After I very enthusiastically accepted the offer to be the American Geoscience Institute’s William L. Fisher Geoscience Congressional Fellow, I joined my Science and Technology Policy Fellowship colleagues in Washington, D.C., for a two-week-long orientation hosted by AAAS in September 2017. We all took away a common theme from orientation: Although science may not have the final say in policymaking decisions, our voices were needed more than ever in the federal government. Following orientation, the legislative branch fellows parted ways with the executive branch fellows and the time for placement was upon us. Congressional fellows have many options for placement. Fellows must choose between working in the Senate versus the House of Representatives and also must decide whether to work in a personal office or on a congressional committee. Placement is a completely personal decision that depends on what the fellow wants to get out of her year in Washington. I found the interview period to be rather tense and frantic, but also enjoyable. I believe I interviewed with five different offices on the first day. I immediately knew from my interview with staff members working for Sen. Ed Markey that the office would be a good fit for me as they were looking for a fellow who had an interest in climate, environment and energy policy. Two days later, I had an interview with the senator himself and was offered the position. Sen. Markey has hosted science and technology fellows for years and is known as a champion of science. Sen. Markey is currently the chair of the Senate Climate Change Task Force; ranking member (top Democrat) of the Senate Commerce Space, Science, and Competitiveness Subcommittee; and is also a member of the Senate Committee on Environment and Public Works. I approached the fellowship with flexibility and was willing to work on whatever tasks Sen. Markey’s office needed, which turned out to be quite a variety of duties. I coordinated and staffed the weekly meetings of the Senate Climate Change Task Force, with topics ranging from the attempt to repeal the Obama Administration’s Clean Power Plan to the health impacts of mountaintop removal mining in southern Appalachia, to the influence a warming climate has on the ski industry of the Western U.S. I also became an expert in commercial space policy and worked on a bipartisan bill, S. 3277, the Space Frontier Act of 2018, with the offices of Sens. Ted Cruz, Bill Nelson and John Thune. I contributed language to this bill that reflected Sen. Markey’s priorities and had the opportunity to see this legislation pass the Senate Committee on Commerce, Science and Transportation. It now awaits consideration before the full Senate. Other duties included writing floor speeches, crafting press releases, writing oversight letters to various government agencies and staffing the senator at committee hearings. Q: What are you doing now and how did the AAAS Science and Technology Policy Fellowship help lead you to your current position? A: I am now a visiting assistant professor in the Department of Geology and Environmental Science at James Madison University in Harrisonburg, Virginia. I realized that I truly loved to teach above all else while advising the senator and senior staff on science and space policy issues. As my Science and Technology Policy Fellowship year in the Senate ended, I felt the strong urge to take all I had learned and all that I had experienced during this very special opportunity and spread the word to the academic realm — to students, postdocs and professors alike. I’m currently teaching three courses, and one of them, called Science Policy and Global Impacts, I specifically designed to reveal to students there is such a world as science policy and to explore with them the many ways that science can impact policymaking. Q: What career or personal advice do you have for postdocs and near-to-graduating doctoral students? A: The (fellowship) proved to me just how versatile a PhD scientist can be. Academia is certainly one route PhDs can take, but it is far from the only route. I would advise recently graduated and near-to-graduating doctoral students to talk with your mentors and use conferences and meetings to find out about opportunities like the AAAS Science and Technology Policy Fellowship — they’re out there! Go to sessions that interest you, even if you don’t know much about the subject and build professional relationships. My year in Congress revealed that we need as many PhDs as possible working in the realms of policy, industry and beyond.